This is a picture that PETA created, an animals rights group. They are an example of an amazing organization taking a stand against many companies that abuse animals. For many people, Sea World seems like a majestic place where whales lead a beautiful life, and people get the chance to observe this life. However, this is far from the truth. Sea World has perfected their ways to display whales living happy lives. Whales are one of the largest species alive. They are magnificent creatures that show many signs of compassion. Their home is the ocean. 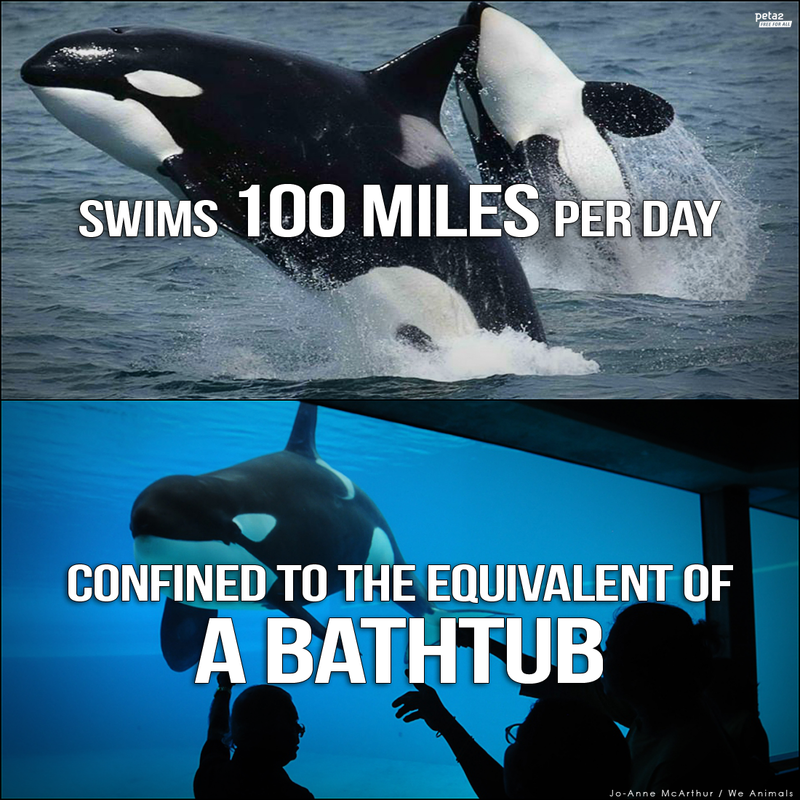 But because of Sea World, their home is a cage. Imagine living the rest of your life in a bathtub. If you are a whale in Sea World, this is not imagining. This is reality. In the wild, the average female whale lives to be around 50 years old. In Sea World, the average age of death for females is around 12. Not only do they have shorter life spans, but the time they do spend living is worse than anything they could endure in the wild. Whales in Sea World are forced to train many hours per day, and then to perform the tricks they have worked on. Similar to humans, whales do not like to be controlled. And what humans would choose to be captured from their home, stolen from their families, and forced to perform for crowds? This life appeals to no humans or whales, but whales do not have a voice. They cannot say no, and if they do not do what the trainer is trying to get from them, they are abused. Each time someone buys a ticket to Sea World, the whales to have to perform, which means they to have to rehearse, which means they must be captured. However, people still buy these tickets. Why? Because of the idea, because of the marketing, because of the advertisers, the location, the workers, not realizing what’s hidden behind the scenes. It seems like a great idea, and a great experience. And it is understandable why people decide to go. Whales are very interesting creatures, and they are so much fun to see. But what’s more fun is to go out in the wild and see them. You can go out on a boat with many other tourists, and have a guide point out the different kinds of whales you see. It is a great way to see the amazing lives of whales but without the cruelty. If you want to learn more about Sea World and the treatment of their animals, I suggest watching Blackfish, amazing film that is so touching and very eye-opening. There are many people and groups taking a stand against Sea World, and I suggest that you do too! They have committed so many wrongs, and it is up to us to make it right. Whales do not have a voice, but you do.